Ringstar’s Michael “Gloves on Fire” Dasmarinas, impressed the packed crowd at Kerry Sports at Shangri-La at the Fort, with his speed and strong punches, at an open media workout held recently. He is set to take on French boxer Karim Guerfi on April 20, 2018, and both are eyeing the IBO world title in the main card of Ringstar’s ‘Roar of Singapore IV - Night of Champions’, to be held at the 10,000-seater Singapore Indoor Stadium. Dasmarinas who is currently ranked 12th by WBC says, “Suportahan niyo po ako at pagdasal sa laban na ito sa April 20 sa Singapore, at sana po manalo tayo. Hindi lang po ito para sa pamilya ko, para sa bansa din natin ito.” (Please support and pray for my fight on April 20 in Singapore, I hope we win. This is not only for my family, it is also for the country. 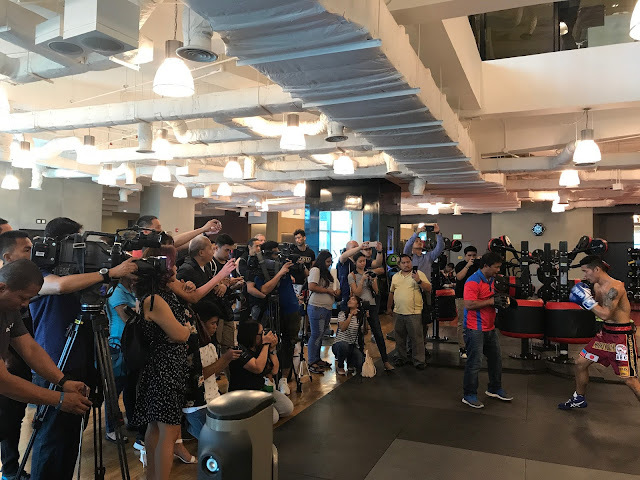 Photo Caption: Ringstar’s Michael Dasmarinas who topbills ‘Roar of Singapore IV - Night of Champions’ at the Singapore Indoor Stadium on April 20, shows off his wares at a packed open workout at Kerry Sports at Shangri-La, BGC.